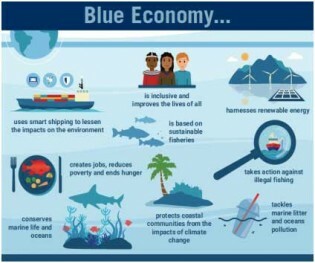 By efficient management, the sustainable exploitation of resources in oceans, seas, lakes and rivers—also known as the blue economy—could contribute up to $1.5 trillion to the global economy, according to the Organisation for Economic Cooperation and Development, an intergovernmental organization comprising of 36 countries. Lake Malawi, Africa’s third largest lake, provides an economic lifeline to many fishing families. But overfishing is affecting many of these lives, with women being affected the most. Twelve-year-old Naa Adjeley lives in Glefe, a waterlogged area that is one of the biggest slums along the west coast of Accra, Ghana. The sixth grade student, his parents and three siblings use 30 single-use plastic bags per day for breakfast. It was just three and a half years ago that the Sanwoma fishing village, which sits between the sea and the mouth of the Ankobra River on the west coast of Ghana, experienced perpetual flooding that resulted in a loss of property and life. Currently 30 square kilometres of Lake Victoria, which stretches to approximately 375 kilometres and links Tanzania, Kenya and Uganda, is covered with the evasive water hyacinth that has paralysed transport in the area. But scientists are harvesting and fermenting the weed, and one intrepid chemistry teacher has built a business out of it. The Blue Economy is becoming an ‘El Dorado’, a new frontier for traditionally arid and water-stressed nations in the Middle East and North Africa (MENA), according to Christian Averous, Vice President of Plan Bleu, one of the Regional Activity Centres of the Mediterranean Action Plan developed under the United Environment Regional Seas Programme. Despite the deep, cold waters, newly discovered undersea mountains off Canada’s west coast are home to a rich diversity of life. The fashion industry is the second largest polluting industry in the world. Pesticides and insecticides used on crops grown for fabrics together with the chemicals used in the production of fabrics cause enormous damage to the environment. In the rugged mountainous highlands of Papua New Guinea in the southwest Pacific Islands fish farming has transformed the lives of former prisoners and helped reduce notorious levels of crime along the highlands highway, the only main road which links the highly populated inland provinces with the east coast port of Lae. Women make up about half of the over 120 million people whose livelihood depend on the blue economy. But women play only a marginal role in the blue economy with most of them earning subsistence income. Women are mainly excluded from more important aspects of the Blue Economy like shipping and large scale fishing. Africa risks being the worst plastic-polluted place on earth within three decades overtaking Asia, says a continental network calling for African contributions to solving the growing threat of marine waste. The first every global conference to address the twin focuses on both conservation and economic growth of the oceans has fulfilled the broad range of expectations it set out to define. Fish will soon be off the menu, unless global leaders strike a deal ending multi-billion dollar harmful fisheries subsidies blamed for threatening world fish stocks and widening the inequitable use of marine resources. The first global Sustainable Blue Economy Conference will be held in Nairobi, Kenya from Nov. 26 to 28 and is being co-hosted with Canada and Japan. Over 13,000 participants from around the world are coming together to learn how to build a blue economy. Throughout history, oceans, seas, lakes and rivers have provided life and livelihoods to people around the world. Today, they are a multi-trillion-dollar global economy supporting hundreds of millions of people and helping drive economic growth in all corners of the world. Australia’s remote north-western Kimberley coast, where the Great Sandy Desert meets the sapphire waters of the Indian Ocean, is home to the giant Pinctada maxima or silver-lipped pearl oyster shells that produce the finest and highly-prized Australian South Sea Pearls. This November, Canada, along with Kenya and Japan, is proud to host the world’s first global conference focused on the world’s ocean economy: the Sustainable Blue Economy Conference in Nairobi, Kenya. In a matter of days the world’s blue economy actors and experts will converge in Nairobi, Kenya for the first ever global conference on sustainable blue economy. The blue economy has quite rightly been described as the ‘New Frontier of the African Renaissance’. Its potential for a continent on which almost two thirds of its states have a coastline, whose trade is 90 percent sea-borne and whose lakes constitute the largest proportion of surface freshwater in the world, is enormous.